At its most basic functionality, the $299 Bragi Dash promises to be the world's first truly wireless set of earphones. That means there's no wire tethering the left earbud to the right. However, focusing solely on that attribute is a simplistic view of the Dash, and the wireless in-ear monitors (IEM) aim to do a lot more for its wearer. Bragi dubbed the Dash as a 'hearable' given its ability to quantify your life, and CEO Nikolaj Hviid said that the ears offer a much more precise location from which to measure health data than the wrists. With its 23 embedded sensors, the Dash offers a hopeful glimpse at a smarter wearable future. Much like a wrist-worn wearable, Bragi paints the promise of a fitness coach, a health aid and a connected digital assistant all in one device. Over time, as Dash gets smarter and gains better battery life so that it can continuously record health data, we can expect it to help us train for marathons, call for assistance when we fall and even become a real-time translator with its built-in microphone and transparency mode. With the growing interest in hearables – from Samsung Gear IconX to LifeBEAM's Vi – Bragi seems to have a head start in its creation and launch of these wireless smart earbuds. But are they the hearables you should opt for? Read on to find out. The Dash comes with an attractive – albeit bulbous – teardrop design, making the earbuds less discreet, more smaller, advanced hearing aids. Given the size, I expected Dash to quickly fall out of my ears, but fortunately that wasn't the case and the eartips provide a secure and comfortable fit. The Dash comes pre-installed with an extra-small eartip, and the box contains three additional sizes of silicone tips to help you get the best fit. To secure the earbuds, you'll need to insert them into your ear canal and rotate to lock them in place. Earlier this year, Hviid announced a partnership between Bragi and hearing aid manufacturer Starkey, which will result in custom moulded ear tips for Dash in the future. Even without the custom moulding, Dash remained in place during my bumpy train commute and the buds didn't fall out when I went jogging. Like a Fitbit, the earbuds can be paired with an iPhone or Android smartphone, but Bragi's ambitious goal is to someday turn Dash into a standalone computer. Today, Dash ships with 4GB of storage so you can listen to music stored on your earbuds without having to carry your phone on a run. The right and left earbuds communicate with each other using near-field magnetic induction, a technology that's borrowed from hearing aids like those made by partner Starkey. This eliminates latency and allows both earbuds to pipe out synchronous audio. To communicate with your phone, Dash relies on Bluetooth. When paired to your phone, the companion app allows you to tweak Dash's settings and monitor your workouts and health data. Once you remove the set from its packaging and place them in your ears, the earbuds automatically power on. Getting started with Dash can be intimidating given that there are no buttons on the earbuds, nor is there a touchscreen as on a smartwatch. A touch sensitive surface is located on the top of each earbud, allowing you to interact with Dash like a touchpad on a laptop through a series of swipes, taps and presses. This makes interacting with Dash seem more like sending morse code than tapping on a touchscreen. It's a bit complicated at first, especially since there are different touch commands for the left and right earbuds. For activity tracking and fitness monitoring, you'll want to touch the left Dash, while the right Dash is used to control music playback. Once you get used to the taps, it's an unobtrusive way of commanding the device. Still, I would love to see Bragi add voice command to Dash in the future to make it more competitive with artificial intelligent assistants, like Siri and Google Now. Asking Dash to tell me my heart rate with my voice while on a run is far easier than trying to remember how many taps are needed to call up this information. To acknowledge that your swipes and taps are registered, Dash will confirm with a voice or audio beep. If you're not wearing Dash, the earbuds are smart enough to power down to save battery. I had a few minor quibbles with the Dash. First, only part of the surface of Dash is touch sensitive. If you're not touching the right area, you won't get a response. Second, if you're fumbling with Dash in an attempt to get the earbuds in your ears, chances are high that you'll inadvertently touch Dash's touch area and activate a command. Configuration of the earbud is done through the companion smartphone app called Bragi. On the iPhone, after you program Dash, you'll have to 'eject' the earbuds before the settings take effect. Failing to do so will place the earbuds in a state of limbo, but you can quickly reset the buds to working order by placing them in the portable aluminium charging case. This is arguably the Dash's most attractive feature. You can ditch the sports watch and the phone and hit the gym or the outdoors with minimal fuss. Currently there's dedicated tracking for running, cycling and swimming. We've focused on running and swimming for now but we'll add more on cycling at a later date. Getting up an running is relatively straightforward. Once you've paired the buds to the Bragi app, you'll be able to select run tracking from the Activity hub. Here it'll show you that you can see heart rate, steps, distance, duration and calories. When you're out, voice prompts will keep you updated on heart rate status, steps and duration. You can double tap on the left earbud to get an update, but that's easier said than done as sweaty fingers make it difficult to get it right the first or even second time. Running with a hood over your head is not recommended as well based on our experience. The sensitivity of the controls on the buds mean it's all too easy to accidentally turn on the audio transparency feature. That transparency feature does work well though, with the built-in microphones letting you clearly hear your surroundings if you're worried about running near busy roads. Sound quality is strong as well. It takes a few sessions before you can appreciate how well rounded it is but I would have preferred more in terms of maximum volume. As far as fit goes, they simply do not budge. While they look a little on the big side, it's easy to secure them in place and in large they are comfortable. I did find on a few occasions though that the charging area where there's two protruding pieces of plastic can become slightly pinch inside the ears during longer runs. So how does tracking fare? I took it out with the Runkeeper and you can quite clearly see from the screenshots above, the distances recorded are way off. While real time heart rate readings are generated during runs, the information is not saved anywhere in the app afterwards giving you no way of reviewing the data. Based on what I remember of those runs, I didn't feel the readings were all that accurate or in line with what my TomTom Spark and Polar H7 heart rate monitor chest strap delivered. Again, these extra metrics are elements Bragi says it'll add in the next software update. If you were a runner and you bought it now, I'm not sure you'd be all that impressed. Battery life is interesting as well. The Dash promises 3 hours, which is enough for a very fast marathon. That can be less and closer to 2 hours, if you're tracking and streaming music from the built-in player. That's why having that charger case nearby is so essential. Before the Dash, swim tracking has pretty much been based around watches you wear on your wrist or devices you clip onto your goggles like the XMetrics Pro we reviewed recently. Bragi takes that technology and shrinks it into a small pair of earbuds making it a lot easier to monitor pool sessions. At least that's the theory anyway. The first thing to get to grips here before jumping in the pool is getting the right Fitsleeves in place. If you've opened the box and used the ones already stuck on, swimming will require swapping them out for a pair of sleeves that covers the entire outer body of the Dash earbuds. This ensures that the Dash stay put into your ears. We tried without them, and it's near impossible to get them to stay in place. Once the sleeves are on, things do get easier, but it's still a fiddly process. I spent a good five or so minutes trying to get them in place and pull my swimming cap over them. I didn't try them without the shower cap, but I wouldn't feel confident of them staying in place without that extra layer of security. Swim tracking lives in the same section as the running and cycling on the app and you'll need to activate it from the app, which means having your phone nearby to do it. Not ideal really. Once that's done, you'll hear the voice prompt tell you the duration of the swim and your current heart rate. That's your lot. There's no details on lap count or any other swim metrics. From a swimming experience, they didn't move, but I feared all the time that they would pop out of the place. Bluetooth is far too patchy to stream so Bragi suggests using the MP3 player. The sound quality is fantastic once I successfully managed to get it to work. It's full bodied, detailed and surprisingly warm in the bass department. It even retained that quality underwater. That didn't however make up for the fact that once I left the pool after a 30 minute swim and returned to my phone, the connection between the Dash and app had been lost. Once I'd recovered a connection, it had only saved 8 seconds of my swimming session. This happened on more than one occasion. The data that should be provided is on the basic side although Bragi promises to add more metrics in a software update that's currently only available to beta testers. Right now, none of that is available and based on what we can test, the music quality is the best thing we can really say about it at the moment. With the earbuds in, I was pleasantly surprised by the audio quality. Dash delivered a wide soundstage and a good amount of bass on the low end. Listening to music with Dash isn't as good as high-end IEMs, but considering how much technology Bragi managed to cram into the earbuds' compact footprint, the sound quality is pleasing and well-rounded. The same cannot be said about Dash's glitchy Bluetooth radio. I found that Dash managed to maintain a more reliable connection to Android phones, like Samsung's Galaxy S6 or LG's V10 for music streaming, compared to the likes of Apple's iPhone. Bluetooth range was also an issue during my testing. On the iPhone, music streaming from my iPhone 6s Plus cut out intermittently if I moved my head. Even moving the iPhone from my left to my right pocket could cause crackling or make the audio cut out. Fortunately, if you don't want to deal with Bluetooth woes while streaming music, you can store music on Dash's built-in flash drive. In addition to music listening, you can use Dash to take calls. The earbuds come with a bone conduction microphone. To answer a call, you simply nod your head. And if you're in the middle of a jam session, you can shake your head to send your caller straight to voicemail. Call quality was a mixed bag, and I found the microphone cutting in and out during my calls. I wasn't sure if the microphone didn't make proper contact for bone conduction to work properly, or if Dash wasn't able to isolate my voice from the wind or background noise when using Dash as a wireless headset out on the busy streets of San Francisco. On a few occasions, I noticed that if a call came through while I was listening to music, playback didn't resume automatically after the call completed. Even if you don't make a lot of calls on your phone, the microphone also serves another function. True to the company's goal of helping keep its users 'present' without being distracted by screens, buttons or a complicated UI, in 'transparency mode' Dash keeps you immersed in your environment. The function of transparency mode is to allow the ambient background noise to come through your music experience – and you can control how much background noise to let through. This allows you to be conscious of where you are. I found this helpful during my morning runs, as I like to listen to music but hate that I can barely hear if a car is coming up behind me with my headphones on. With Dash, the experience is similar to playing music out of a speaker – you get to enjoy your jam without losing track of your surroundings. Even though Bragi claims that transparency mode allows you to be more 'present' in your environment than being face down swiping through a smartwatch on your wrist, I am not sure that the device has overcome preset societal norms. With my Dash in, friends would still assume I was disengaged from any conversation. If you're looking for long music listening sessions, the charging cradle comes equipped with its own battery, so you can drop the buds in to replenish. The cradle is capable of delivering full charges to Dash, allowing the device to be used all day. Even though the cradle helps give Dash all-day power, the downside is that it can't continuously record health data throughout the day. For fitness junkies, this could limit the device's appeal when compared to Fitbit's and Garmin's wrist-worn wearables, both of which can last for at least a few days on a single charge. The battery design also means that, like your smartphone, Dash requires nightly recharging. In its current form, Dash won't be able to help you keep track of your sleep. In order for the earbuds to become more useful, Bragi will have to overcome the design challenge of packing so many sensors and circuitry, along with a battery, into the compact design. Bragi Dash’s button-less and screen-less interface means it can someday compete with less compact digital assistants like Amazon's Alexa. But to get there, you’ll need to understand Dash’s complicated language of taps and swipes, overcome the potential for being socially misunderstood and embrace that Dash still is in its infancy. 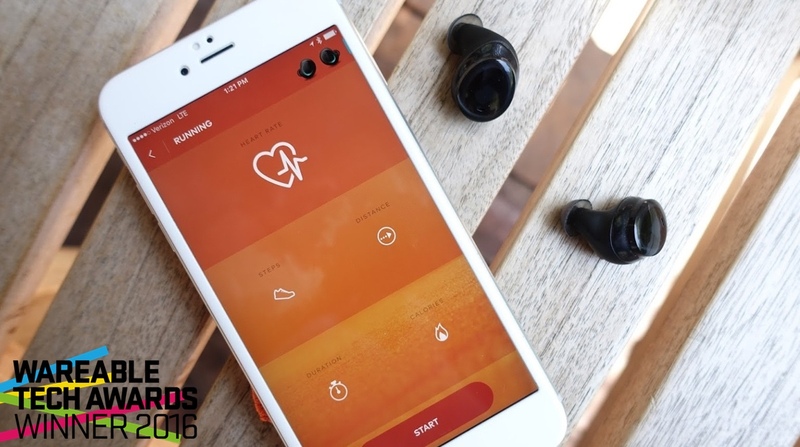 The earbuds need to get a lot smarter to become a ubiquitous, omnipresent assistant. For now, though, Bragi is one of the few wearable companies to offer a clear vision for what it hopes to achieve. It’s a solid vision if you want to take the long-term gamble, but short-term investors may not find the immediate payoff worth the risk, especially at a $299 price point.